The entry-level smartphone in Samsung’s upcoming new Galaxy M series has made its first public appearance. 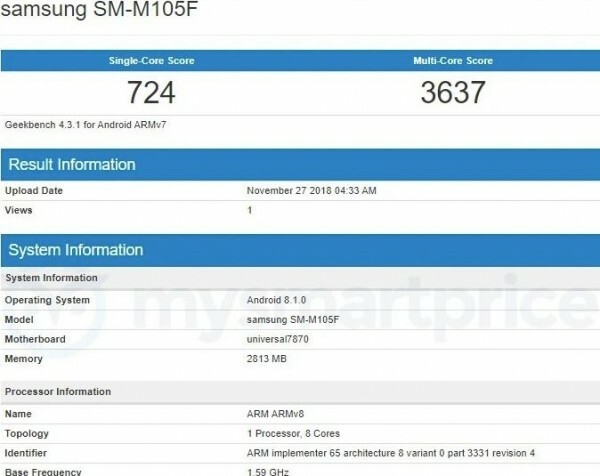 The Galaxy M10, model number SM-M105F, was briefly spotted (and subsequently removed) on Geekbench. Samsung’s Galaxy M series is set to take over from the Galaxy On series. Just yesterday we got our first informative details about the Galaxy M lineup. The lineup will consist of the Galaxy M10 (SM-M105), the Galaxy M20 (SM-M205) and the Galaxy M30 (SM-M305). The M10 will come in 16GB and 32GB storage configurations, the M20 in 32GB and 64GB and the M30 in 64GB and 128GB – all three will launch in Blue and Dark Gray colors.